One year ago today the fascist Turkish state launched its brazen invasion of Afrin canton in Rojava. Empowered by the imperialist powers, specifically Russia, the US, and several EU/NATO countries, Turkey embarked on a barbaric campaign aimed at stopping revolutionary momentum in Rojava, and continuing its colonial campaign against Kurdish liberation. Afrin Canton was renowned, being one of the most peaceful regions in Syria throughout the entirety of the Syrian Civil War. The nation-states involved in the Syrian War felt Afrin – and the Rojava Revolution in particular – was an obstacle to furthering their geopolitical ambitions. The Russian state wanted the regime to have total control over the territory, while the Americans believed Turkish appeasement was paramount to maintaining its dominance in the Middle East. With all these mammoth obstacles revolutionaries put up a valiant resistance and held the territory for several months. The guerrilla campaigns against the Turkish state and resistance against ISIS fascism in the previous years provided an example in sacrifice, dedication, and most importantly, experience in the battlefield. The resistance in Afrin saw the birth of several new revolutionary formations. The Anti-Fascist Forces in Afrin (AFFA), coupled with its main fighting component the Sehid Michael Israel Brigade was announced. Michael Israel was a Sacramento, California based revolutionary who died defending the revolution. AFFA was founded as an emergency response to the invasion. The group consisted of former commanders and fighters from the International Freedom Battalion and various YPG units. Devrimci Güçler was another revolutionary formation that became active in the defense of the revolution. In their founding statement they stated they were fighting against occupation from Palestine to Afrin making clear their internationalist perspective. Both of these constellations were comprised of revolutionaries from TIKKO, BÖG, MLSPB, TKEP-L, MKP, and anarchists as well. This coordination is significant and demonstrates a fundamental maturation in revolutionary organizing that acknowledges our historical responsibility in the fight against fascism and occupation. While these were temporary military formations, they should be viewed in a larger context. Rojava has birthed several new revolutionary alliances that will prove significant in the near future. 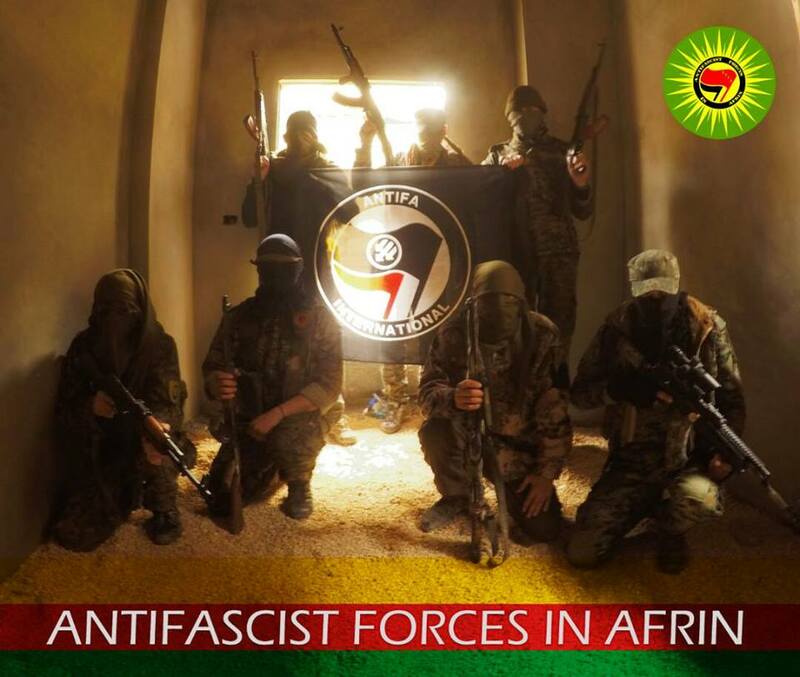 The International Freedom Battalion (IFB) was established in Rojava, and was an extraordinarily important formation for defense of the revolution. The IFB, for instance, also established the conditions for the formation of Halkların Birleşik Devrim Hareketi (HBDH), which is an alliance of revolutionary forces fighting for the overthrow of Erdogans’ fascist regime. The influx of international revolutionaries set the stage for the announcement of the anarchist military collective Tekoşîna Anarşîst who has defended Afrin as well, but now is preparing for future conflict in Rojava. The Turkish state’s occupation has led to tremendous displacement and suffering. The Syrian Observatory for Human Rights estimates 300,000 Kurdish people have been expelled from Afrin. Hundreds of civilians were killed from the Turkish state and allied Free Syrian Army regiments. Thousands of YPG forces were killed in the fighting as well from the Turkish air force. The revolutionary forces lost many fighters as well. Anarchist fighter Şevger Makhno, from Tekoşîna Anarşîst, died in the struggle. International anarchists, Haukur Hilmarsson and Anna Campbell, also fell in combat. Sinan Ate, Nurhak Cem, Bayram Ali, and Taylan Demircioğlu are other revolutionary fighters who fell in the struggle, who haven’t gotten as much international acclaim but who will permanently celebrated by international revolutionaries. The occupation in Afrin is now being met with a fierce guerrilla campaign led by the Afrin Liberation Forces. The Turkish state and its proxies are taking heavy losses on a daily basis. As the United States prepares its withdrawal from Syria the Turkish state is preparing for a full scale invasion of revolutionary territory. The defense of Rojava’s political project is paramount.. Revolutionary forces on the ground have sacrificed and set an example for solidarity. But as fascist forces prepare to attack it becomes increasingly important for organizations around the world to prepare. The Turkish state is sleepwalking to its own death, but without international pressure against all fascist and capitalist forces this dance with counter revolutionary forces will continue in perpetuity. Rojava have bore the brunt of these struggles, but in the near future we should create two, three, man Rojava’s.